Kotze (l) speaks to his young charges. 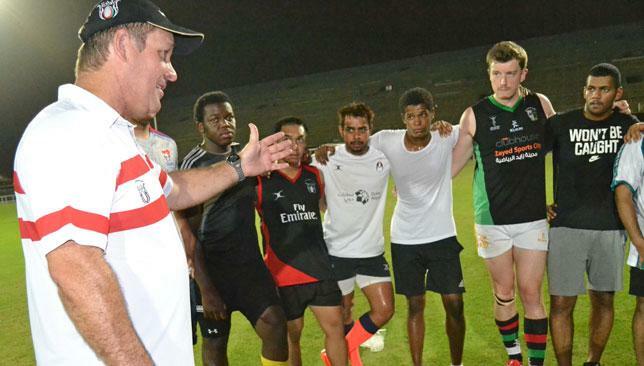 The UAE have announced their squad to take part in the Asia Rugby Under 20 Sevens Series later this month. Roelof Kotze’s young charges will play in both legs of the Series, the first taking place in Malaysia this weekend (August 15-16), the second a week later (August 21-22). UAE performance manager Kotze has picked 13 players in his squad, eight Emiratis and five expatriates. The squad has a heavy Al Ain Amblers presence, with eight of the squad coming from the Garden City club. The Amblers’ contingent includes Emiratis Hamad Al Shkeili, Younes Al Blooshi, Khalid Al Junaibi and Abdulla Al Shkeili, as well as expats Jeremaia Kilicanasau and Tomasi Tirikula, both Fijian, American Devante Steele and Iranian Ebrahim Doraee. Abu Dhabi Harlequins’ Adel Al Hendi, Dubai Exiles’ Fahad Sabt and unnattached Majid Al Balooshi complete the local player quota. Unnattached Kenyan Kipruto Chirchir and Heartbeat Tigers’ New Zealander Tuharangi Kahukuranui round up the expat group. The UAE will play hosts Malaysia and Hong Kong and are also scheduled to face the likes of Thailand, Chinese Taipei, South Korea and Kazakhstan in the coming weeks. Kotze is permitted to take a 12-man squad to each tournament but has named 13 players as he is expecting there to be visa issues for one player in Hong Kong. Having competed well on their last outing in Hong Kong in December, winning just two of seven games but losing three by only two points, the South African has stated previously that he is aiming for at least one podium place from the two legs of the Series. “We really want to compete and get in the medals this time and I think we’re on course for that,” said Kotze. “We have a lot more confidence going into this. Training’s really pleased me. The guys worked hard and have given their all, which always pleases me. Up for the battle: Abu Dhabi Saracens (l). West Asia Cup champions Abu Dhabi Saracens will compete against the best teams from West Asia in the inaugural Asia Rugby Western Clubs Champions League next month. The tournament will feature four champions from 2015’s cross border or domestic competitions from the UAE-Gulf, Sri Lanka and Kazakhstan, the winners being crowned the champion club in West Asia. Sarries will come up against Sri Lanka Dialog Rugby League champions Kandy, Kazakhstan National League winners Olymp, as well as familiar foes Doha, the Qatar club qualifying as Gulf Top 6 champions. 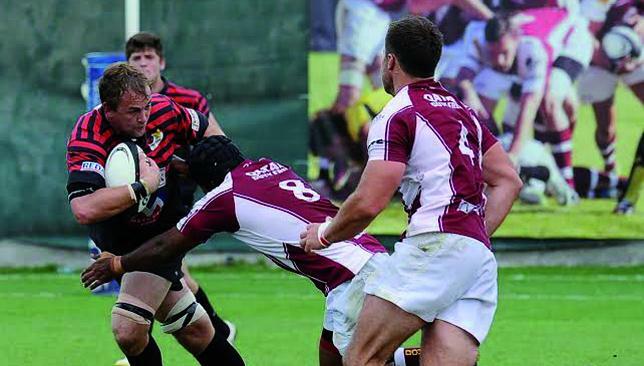 Doha will host Sarries in the Qatari capital, the scene of the Al Ghazal men’s 26-20 West Asia triumph, on Friday, September 11, with Kandy facing Olymp in Dubai the following day. Sarries welcome Kandy to Abu Dhabi on Tuesday, September 15, Doha hosting Olymp the same day. The final fixtures will both be held in Dubai on Friday, September 18, with Sarries taking on Olymp and Kandy playing Doha. Asia Rugby president, Trevor Gregory, said the union plans to host a similar tournament in East Asia, in the hope that the winners of each will meet to contest the title of being Asia’s best team outside of the Japan Top League. “Asia Rugby sees this new, annual competition as the bridge between senior domestic and international representative rugby and hopes it will give clubs the chance to compete for this prestigious new title,” he said. “Asia Rugby also hopes this will provide a new opportunity for clubs to further engage new players, supporters, volunteers and sponsors.